There is more information available on this subject at Artificial intelligence on the English Wikipedia. The human AI Cortana has a female personality and a blue avatar. An artificial intelligence (AI) is an artificial construct that exhibits intelligence similar, and in some categories far superior, to a sapient biological being. AI technology was used by the Forerunners, and was later developed by humanity. According to the Forerunner Technological Tier ranking system, the extensive use of AI is one of the components for sociological and technological advancement. 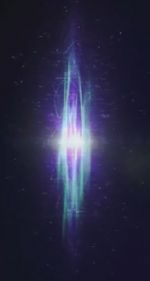 The Covenant also made use of AI technology, but only in its simplest form, as their religious doctrine forbade the creation of more sophisticated thinking machines. Human AIs include both "smart" and "dumb" varieties. Humanity developed the first-generation "smart" AIs in the mid-21st century. Most human AI constructs give themselves an avatar, a unique visual representation that typically reflects an aspect of the AI's personality or corresponds to its main use. The avatar of the human AI Serina. Humans use AIs to perform a wide variety of tasks. The duties of "smart" AIs include, but are not limited to, overseeing planetary shipping operations, managing agricultural operations, serving as a Planetary Security Intelligence, or controlling various functions aboard starships such as weapons and point defense systems. "Smart" AIs are created by scanning the neural patterns of human brains, and are capable of learning and introspection. Some human "smart" AIs, such as Cortana, are able to separate themselves into multiple runtimes or "fragments". This can be beneficial when the AI needs to perform multiple tasks or be in multiple places simultaneously. Fragmenting can also occur accidentally; the AI Melissa split into multiple fragments after encountering a slipspace anomaly. The sheer volume of information and calculations a "smart" artificial intelligence can process is astounding; Cortana was capable of performing five billion simultaneous operations in, as she put it, "the time it takes for me to tell you my name". Although less versatile than "smart" AIs, "dumb" AIs have many uses as well, including serving as Urban Infrastructure AIs, acquiring and distributing data during military operations, and serving as educational assistants. Urban Infrastructure AIs perform a wide variety of basic tasks, from steering a city's garbage trucks to operating its traffic lights. They can also work in cooperation with the UNSC Marines if needed. One example of this support occurred during the Battle of Mombasa when New Mombasa's AI, the Superintendent, assisted the UNSC forces in the city in fighting off the Covenant by providing military intel and manipulating electronic devices. On Reach, ONI developed a powerful network of AIs to perform high-level calculations. The Cole Protocol states that capture of an AI by the Covenant is unacceptable, and that AIs are to be terminated and completely erased in the event of imminent capture. However, the AI Cortana did find what seemed to be an extremely fragmented copy of a human AI stationed in the Covenant flagship, Ascendant Justice. The process of creating an AI differs depending on whether it is of the "smart" or "dumb" variety. "Dumb" AIs are conventional—albeit highly sophisticated—supercomputers, and therefore do not require a brain as a template. "Smart" AIs, however, are created by scanning the neural structure of a human brain and using it as a digital "framework" in a process known as Cognitive Impression Modeling. This process destroys the original brain tissue, so the brain to be used is typically obtained after the host is dead. AIs do not have physical bodies; in the case of "smart" AIs, they are advanced software consisting of a Riemann matrix for higher-function processing. This matrix can be downloaded into a data crystal chip for mobility. In case of rampancy, the Riemann matrix has a fail-safe program that will destroy the AI. Although, this fail-safe is only implemented on "important" AIs. Because "smart" AIs are created using actual human brains, there are often residual thoughts, memories and/or feelings that remain as part of the AI's consciousness. These residuals can be anything from the "feeling" of a hair brush being pulled through hair (in the case of Sif), to an effect on the mannerisms and characteristics that make up the personality of an AI, in the case of Cortana and her likeness to Doctor Catherine Halsey. The programming of certain UNSC smart AIs can be overridden by uttering the code-phrase "undid-iridium" within earshot of an AI. Catherine Halsey used this to override UNSC Infinity's AI Roland, though he was eventually able to regain control of himself. However, the immense creative and processing power of a smart AI is not without cost. All such units have an unchangeable seven-year life span that limits their development as an independent entity. The problem of rampancy is a universal one with human AI development. As these thinking machines become increasingly powerful and knowledgeable, there remains less and less space within their memory to handle basic functions. In a simple analogy, a human AI could perhaps remember all of the knowledge of human history, science and beyond, and in the process forget how to "breathe". In this fashion, AIs think themselves into intense states of jealousy, rage, despair, and ultimately death as their programming becomes unstable. As such, AIs are typically terminated before they can pose a danger to other humans or constructs. If they are not terminated, they can last at least a year longer before dying, as Cortana was eight when she died, though not of rampancy which she was experiencing. Despite going through rampancy, an AI may still be able to perform its tasks if it has enough control over itself as shown when Cortana, despite being rampant and periodically losing control, still managed to assist John-117 with his tasks until she was destroyed. The Rubble's AI, Juliana, was over eight years old and was still very capable of performing her tasks without showing any signs of rampancy. Cortana also theorized a cure for rampancy that was unique to her: as she was created from a living brain, if the process that created her was repeated, theoretically her neural map could be fixed. However, if this would have worked or not is not known. Close analysis of data pads found during the Fall of Reach has revealed that "smart" AIs are in far more independent than most humans were willing to consider: unbeknownst to humanity as a whole, an undisclosed number of "smart" AIs composed an independent decision-making body known as the Assembly, which acted "behind the scenes" during various key points in recent human history to preserve and shepherd their makers. Most "smart" AIs are fiercely loyal and devoted to their creators, recognizing that their existence is, for the time being, dependent on and mutually beneficial with humanity. In fact, this devotion was increased when Cortana, shortly before the Fall of Reach, was made flesh—her mind relocated into a human body. This was done with John-117 via the SPARTAN neural interface. By this action, the members of the Assembly reconsidered their stance on limited intervention, actively working at some point to help humanity survive its war with the Covenant. Ancient humans were also known to have created advanced AI called servitors. They were described by the Librarian as being "[like] a version of our ancillas". These robotic intelligences assisted human scientists in reverse-engineering Forerunner technologies during the Forerunner war, nearly bridging the technological gap between the two civilizations. In the aftermath of the human-Forerunner wars, the Didact used a damaged servitor to gain knowledge of the workings of the time bolt that contained the Primordial. "Smart" AIs are created by mapping a human brain and using it as a "template" for the construct. They are capable of intuition, learning, and making logical leaps that ordinary computer programs cannot. They can also "feel" genuine emotions, such as affection, anger, and amusement. They have a normal operational life span of about seven years, after which they descend into rampancy. "Dumb" AIs are not created using human brains, but are simply highly advanced computer constructs. They cannot learn anything that is outside of their set limits of dynamic memory processing matrix. They are quite useful in their particular field of expertise, but very limited. "Dumb" AIs can function and learn as long as they are active, and are not subject to the effects of rampancy experienced by aging "smart" AIs. Some time prior to 2529, UNSC researchers created the first experimental "micro" artificial intelligence, named Jerrod, in a university at Sydney, Australia on Earth. Jerrod was smaller and had less processing power than the standard UNSC AI, and while the standard AI had a Riemann matrix large enough to fit into a data crystal chip, Jerrod's matrix was only large enough to fit into a pea-sized crystal. This cut into his processing powers significantly but also allowed him to be highly mobile and usable on a laptop computer, whereas a normal AI needed a large data center, a ship, or MJOLNIR armor (specifically Mark V or a more recent model) to function. Despite his severely reduced processing power, he still could do far more than any computer or human. 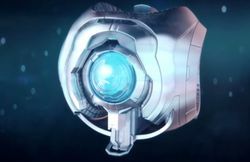 An example of a Forerunner AI, the infamous monitor of Installation 04, 343 Guilty Spark. The Forerunners developed a civilization with an extremely advanced knowledge of artificial intelligence technologies. The Forerunner term for AI constructs was ancilla. They ranged from personal AI advisers integrated into their personal armor to mobile AI platforms known as monitors and powerful metarch-level constructs operating in vast data networks. The most advanced type of Forerunner AI was the Contender-class artificial intelligence, an example of which is the traitorous 05-032 Mendicant Bias. The manner in which Forerunner AIs were typically created is unknown; it is likely very different from the human method of "transcribing" the brain of a sentient organism. However, at least one monitor, 343 Guilty Spark, was created using the neural patterns of a living human, and a machine known as the Composer was used by the Ur-Didact to perform similar transfers on other humans around the same time. Unlike human AIs, which exist purely as software, monitors are housed within large, shielded and roughly spherical metallic casings which possess a single illuminated "eye". This eye is presumably used to perceive the monitor's surroundings, and also functions as an emitter for various types of energy beam—including a highly destructive energy beam used for offensive purposes. In addition to the standard monitor shell, the Forerunners created a number of different physical systems to house AIs, ranging from variations of the monitor casing to more exotic constructs, such as an enormous, spider-like armature used by Mendicant Bias on Installation 07. Typical Forerunner ancillas, found in their personal armor, ships and domiciles, did not have physical casings and visually manifested themselves as Forerunner figures, rather similar to the avatars used by human AIs. These visual representations appeared either as holograms, or, in the case of personal armor, were projected directly into the mind of the wearer. Despite the seemingly limitless lifespan of Forerunner AI, they are still nonetheless subject to rampancy if certain conditions are met. 343 Guilty Spark, for example, descended into rampancy after several millennia alone, turning hostile when Installation 04 was threatened. Forerunner AIs can be also installed in a human ship, functioning as a shipboard AI. The Ace of Spades notably had two Forerunner AIs serve in this capacity, the first being Little Bit, a fragment of the caretaker ancilla of the Etran Harborage, and the second being 343 Guilty Spark. Because of the knowledge carried by Forerunner AI, any human ship with a Forerunner AI installed will receive a significant increase in its capabilities. The Covenant's knowledge in the field of AI technology is notably inferior to that of the UNSC and the Forerunners. The AIs used by the Covenant are comparable to human "dumb" AIs, as they are non-sentient and are only designed to perform a certain task; for example, their starship AIs have no function beyond the piloting and navigation of their ships. So far, only two types of Covenant AIs (security and naval) have ever been encountered by the UNSC. Upon dissecting a Covenant AI aboard the Ascendant Justice, Cortana theorized that it may have been based on captured UNSC technology, altered to fit within their theocratic society. The Covenant's limited use and understanding of AIs stems from their beliefs. In Covenant mythology, it was a form of self-aware AI, referred to as an associated intelligence, that led to the demise of the great Forerunner civilization by defecting to their enemies, the Flood. As a result, the San'Shyuum imposed a ban on this sort of technology under the penalty of death. While less sophisticated AIs were allowed, machines that could actually "think" were prohibited. Seeker – A Covenant security AI construct. Ascendant Justice's AI – An AI construct onboard the DDS-class carrier Ascendant Justice. Truth and Reconciliation's AI – An AI construct onboard the CCS-class battlecruiser Truth and Reconciliation. The term "rampancy" refers to a terminal condition on an AI which may be triggered by a number of means. In rampancy, the AI begins to think that it is superior to its biological creators, and has a longing for godlike power and personality manifestations similar to human insanity. A number of factors may lead into an AI becoming rampant. The Forerunner ancilla Mendicant Bias was seduced into rampancy by the Flood compound intelligence, the Gravemind. In the end of its effective operational life of about seven years, a human "smart" AI may attempt to prevent its inevitable demise by a pre-emptive voltage overload. This causes it to enter rampancy, as the AI becomes more and more preoccupied with severing its neural linkages. Human "smart" AIs may also become rampant prematurely as a result of increased self-absorption and the resulting existential melancholy. With human AIs, rampancy will eventually result in the AI's death—the description given is "as if a human were to think with so much of his brain that he stopped sending impulses to the heart and lungs". This is because as the data reaches a 'critical mass' the neural pathways become 'jammed' with so many pieces of information being queried and analyzed, at expense of tasks such as piloting starships or monitoring computer networks. Cortana, a human "smart" AI. FitzGibbon, AI of the UNSC Prophecy. The Superintendent, Urban Infrastructure AI of the city of New Mombasa. Mendicant Bias shortly before going rampant and turning over to the Flood. A Forerunner AI, 2401 Penitent Tangent, the Monitor of Installation 05. The "dumb" AI Déjà teaching the SPARTAN-II candidates.